"This is a wonderfully easy recipe. It's my family's favorite because it has a sweeter sauce." 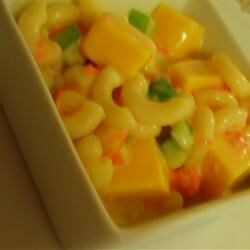 In large bowl, combine pasta, carrot, green pepper and onion. In medium bowl, combine vinegar, sugar, condensed milk, mayonnaise, salt and pepper. Toss salad with dressing and chill 4 hours in refrigerator before serving. This pasta salad is great as is , my grandmom has made it for years but the key is ....to make it and then let it sit for 24- 36 hours or it will be to sweet and too thin. Yum! My family really liked this recipe. Adjust the sugar to your taste. I throw in some leftover chicken to make a cool, main dish for dinner or a great lunch. This is by far the most delicious pasta salad I've ever tasted!! my family and I loved it! It truly is a "keeper"!